Celebrating Coronado, the best beach in the US! San Diego’s Coronado Beach was just named the “Number 1 Beach in the United States” by Florida International University’s professor, Dr. Beach. Are we surprised? Not really! The beautiful, expansive beach is a favorite place for students and staff to hang out after class and on the weekends. According to Dr. Beach, Coronado has “near-perfect Mediterranean weather and a postcard backdrop”. What beautiful imagery! Several of our students decided to describe Coronado as well, and below are their articles on the most beautiful beach the United States has to offer. From the moment you roam along the more than 3,000 meters of the ‘Bridge of Coronado’, which has linked San Diego with Coronado for over 30 years, you can appreciate the scenery (and height!) you feel when leaving this small city. Not everybody can afford to live there; in fact, it’s one of the most expensive districts in California, and that’s something you’ll notice, in the streets, in the houses, in the cars, and in the people you’ll find in it. The first thing you’ll see arriving to the beach, will likely be the famous Coronado Hotel, an awesome set of wood buildings that works as a luxury beach resort. Surely you’ll stop five minutes to take a couple of pictures. And finally, you’ve arrived! It is there, in front of your eyes, the famous Coronado Beach, a very long white and bright sand beach, where taking in the sun and bathing will be a true pleasure. Whether you go with friends, as a couple or even alone, I’m sure you’ll enjoy the time you spend there, and if you stay until late, don’t forget to photograph the magnificent landscape of the latest hours of the evening, when the sun hides in the horizon. Is time to return home, but without doubt, you’ll be thinking in when you’ll have the chance to come back. Have you ever sat at a beach and watched dolphins playing in the ocean? If a good friend were to ask me: “Hy Richi, tell me a “must see” in San Diego” I would answer him: “Coronado Beach, my friend!” Isn’t it an amazing place? Coronado is a cute small island across the San Diego Bay west of downtown San Diego. Coronado is so attractive for tourists because of the white beaches that have earned it ratings as one of top beaches in the U.S.A. In front of the gorgeous, fair and beautiful Hotel Del Coronado is one of the nicest places in San Diego to watch dolphins play together and eat a swell ice cream or a coffee from the Hotel Del. If you are lucky, you will see the dolphins playing and surfing together in the ocean in the front of the famous Hotel Del. 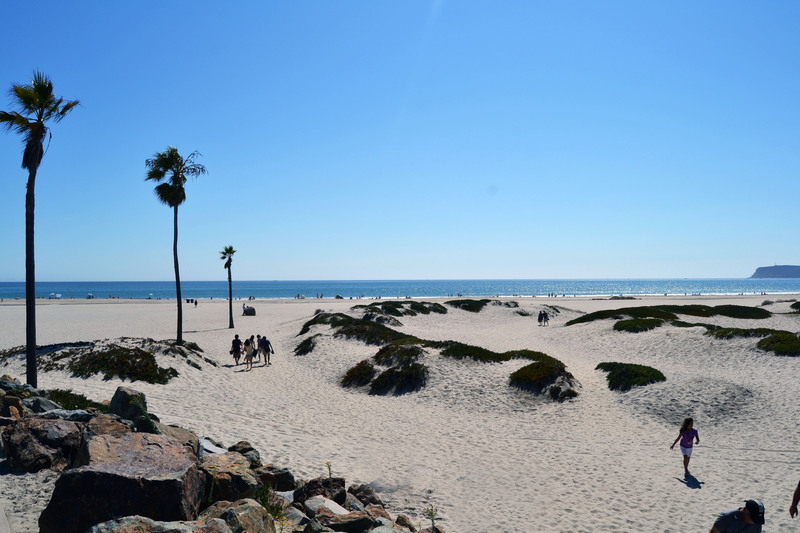 Perfect weather, clean and white sand and a beautiful scenic hotel… Coronado Beach is the most beautiful place that I have ever been to in San Diego. When you are stressed from your work or school, you can lay back and chill out on the sand. Also, if you want to play volleyball with your friends, there is a volleyball court on the sand. Normally there are not a lot of people, so you can take a rest in peace. If you are lucky, you can see dolphins in the sea! Don’t you think it sounds great?